We began planning our dream to move to Vancouver Island in 2005. We were familiar with some of the benefits (both economically and ethically) of “green living” and made a decision to continue and enhance that lifestyle. We also knew that the home had to meet the criteria to allow us to “age-in-place”. From Alberta we researched “green” builders between Mill Bay and Nanaimo and checked customer reviews. One name kept turning up – GNB Builders. We called from Alberta and set up a time to discuss our dreams with Heidi and Greg Bianchini. The process involved their excellent listening skills to “hear” what we were saying and to guide us through the process from selecting a suitable building lot, to designing a house that would meet our requirements – all the while keeping within the constraints of our budget. Heidi had exceptional ability to help us chose colours and fine interior details that were complementary to our personal tastes. Our home was built while we remained in Alberta. We had the utmost confidence in all the GNB staff to build a home of exceptional quality and style. We regularly received photos of the process. Our home was completed on budget and on time in 2015 and we are thrilled with the finished product! Family and friends have asked what we would do differently, and the answer is always the same. Nothing. We write this letter in recommendation of GNB Builders as a general contractor. We had the utmost pleasure of working with Greg and Heidi Bianchini while building our dream home in Ladysmith (2012-2013). Without reservation, we’d highly recommend Greg and Heidi as a general contractor. Greg and Heidi are outstanding in guiding you through the complicated and often stressful process of building your own home. Greg has impeccable vision for how a home should look both inside and within the natural confines of your property. We were constantly impressed with his top quality workmanship and professionalism. You never feel shortcuts were being taken. GNB sub trade selection was excellent in terms of competence and delivery of quality results. Heidi’s superb taste and extensive design knowledge was a huge asset when navigating the endless aesthetic decisions required. She was very generous with her time while learning your tastes and vision and bringing them to fruition. She never forces her ideas on you but allows you to discover your choices. Heidi makes this process fun! Not living in Ladysmith during the build, we looked forward to photo updates. GNB was terrific in supplying a steady stream of photos detailing the progress of our home. We had a special affinity for Kelsey Ann, GNB’s executive assistant. Always calm, Kelsey Ann responded to all inquiries promptly and efficiently. We felt the final judge of a good contractor is how they handle deficiencies once final payment is completed. GNB resolved all deficiencies quickly and hassle free. Our custom GNB home completely surpassed any of our initial expectations. We walked around for the first weeks pinching ourselves. The home was beautiful and included everything we wanted. Greg and Heidi make an exceptional team and we’d highly recommend them for any home building project. We selected GNB as our builder with careful consideration after researching several builders. We reviewed the references from other builders and previous GNB clients. Our main reasons for selecting GNB were; integrity, attention to detail, solid construction, budget consciousness, commitment and follow up. At the time of selection, GNB limited custom builds to four per year, no more than two at a time. This suggested to us commitment to the build, time and attention for on site supervision of the trades, and a very hands on approach. A custom build is an exciting, yet courageous undertaking. There are often challenges and compromises in the process. Greg’s integrity and passion was evident during the build and continued during post build follow-up. We were intimidated by the prospect of building a house – our first. Our friends told us that the stress of it would be a serious test of our marriage. Fear not: from start to finish, the building process was enjoyable, and GNB carried the stress for us! We started out by interviewing several local building contractors, and GNB stood out from all others by their answers about home efficiency, quality, and flexibility to work within our budget. Looking back, we have full confidence that we chose the best. The quality, energy efficiency, beauty and comfort of our home far exceed what we thought we could afford. In terms of cost control, GNB were committed to staying within our budget, despite some surprises on our site. The slope of the land gave us room for a crawl space that was not in the original plans. GNB adapted the design easily, for this and other changes we made, and kept us well informed of costs. The project finished on budget, after allowing for additions we made, and changes dictated by the site. Heidi was a marvelous and irreplaceable resource in finding the right mix of interior finishings to suit our tastes and budget: she took the time to understand our preferences, simplified our choices, and coordinated all the details. Greg is a master at his work, from coordinating trades, to overall home design and adaptation, to fine carpentry details. What a privilege to have our home blossom from their teamwork! GNB finished the house on schedule, and we moved in December 2014. The small remaining details were wrapped up promptly, and over the past year GNB has been responsive and professional with our few requests for follow-up. Despite our modest budget, to our delight and surprise, the house was given the highest Built Green rating: Platinum. We wholeheartedly recommend GNB Builders: you, too, will be delighted and surprised! After countless hours researching builders to build our dream home, we were continually drawn to GNB Builders – we definitely made the right decision! With Greg’s home building expertise and Heidi’s eye for design they made the normally stressful process of building a home enjoyable and as stress free as possible for us, the homeowner. They took the time to ensure every last detail was done to perfection and that, in the end, we were 100% satisfied with the outcome of every aspect of our new home. Greg and Heidi treated our home as if it was their own they were building…they gave us the same end product they would have wanted for themselves and nothing less. We would highly recommend GNB Builders! !Meeting Heidi and Greg Bianchini has been one of the best things to happen to us when we made our decision to build a home for the first time. GNB Builders met and exceeded all of our expectations. The challenges of building the house compounded by the addition of conversing over long distances, including from Shanghai, China, were handled professionally, courteously and effectively by the very knowledgeable team headed by Greg and Heidi. The original concept took many required turns and revisions, which were communicated to us at every step from planning to execution, and they had us in by the estimated move in date!! We are now living in our beautiful new house, which immediately upon moving in, felt like home, because GNB kept us involved in every aspect of the construction and detail of the build. The amount of personal involvement by Heidi and Greg throughout the entire process was and will always be greatly appreciated. When asked if we would recommend GNB Builders to others, the answer is always an emphatic “YES”. Building a home is the most monumental project that most people undertake. It requires a lot of planning, a lot of decision making, and a lot of money. In our case, it also took a lot of trust; since we were building from over 1000 km away. 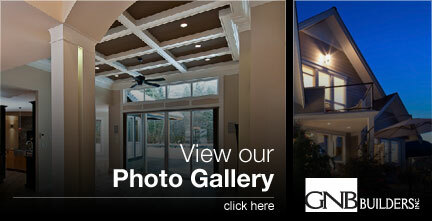 We found GNB on line when looking for a builder in the Nanaimo area. We did our due diligence and checked then out thoroughly. We talked to licensing agents, trade associations, other builders, and other building trade people. They all came back very positive. When we finally met Greg and Heidi, we knew we had made a great choice. Greg is a proud builder. He wants his work to be as perfect as he can get it. I knew from the pictures and visits just how well the home was being built. Working with a perfectionist is very much appreciated. Heidi was able to learn our tastes and wants. She was always prepared with samples and ideas when it came to make design decisions. Our visits were packed to be most efficient. We had the opportunity to watch Greg and Heidi interact to make decisions. They mesh together so well. The artisan in both really came out. They made several independent decisions for us as our home was being built. All of them were as we would have wanted. It would have been tedious to call daily for simple decisions. They did however, keep us well informed. We have been in our home for 5 months; and, there are no surprises; just solid construction and a beautiful decor. I would give them a Platinum rating (LEED rating) just like our house got. When Greg and Heidi, at GNB Builders tell you they can build your dream home, you’d better believe it. We started to work with them in April 2009 and as we were living overseas at the time, we were a little concerned about communications. We need not have worried, as Heidi did an amazing job to keep information flowing via internet and phone calls, so that we were kept up to date with all planning and start up issues etc. Then when we were on the Island both Greg and Heidi spent as much time as we needed to help us choose fittings, fixtures and finishes, and to finalise any changes that had to be made. They steered us cheerfully through delays with the local planning department, and maintained good relations with neighbours around our lot, to minimise possible difficulties when building in an established neighbourhood, where conflicts can often arise. When any problems arose during our build, Greg dealt with them promptly, and with great diplomacy! And as for the house, we can only say that it exceeded our wildest dreams and that we got a home even better than the one we had originally planned. It is light and elegant but also functional, making the very best advantage of the site and surrounding landscape. Many thanks to Greg, Heidi and all those people at GNB Builders associated with our build. Our beautiful forested ocean-front lot, and unique 2-storey log structure was marred by a very dated, inefficient and shabby interior. Minimizing the enlargement to the original footprint, preserving the unique log structure, and keeping it’s charisma, whilst providing a spacious, functional and efficient home, was our goal. Hence, a major renovation was the only option for us, and so we looked for a long time to find a contractor who could turn our ‘cabin’ into our dream home. Once we met with Greg and Heidi, we looked no further, and have never regretted that decision. Our ‘new’ home exceeds all our expectations. Greg and Heidi worked closely with us on the scope of the project, providing creative ideas, guidance, and workable solutions to overcome some of the quirkiness of the original layout. Once we had settled on the scope of work, budgets were drawn up, reviewed, discussed and revised as required, until we were all happy that the proposed work met our needs, and was do-able within our budget. From the outset, even before the jack hammers started the interior demolition work, Heidi communicated tirelessly with us to keep us fully informed of all aspects of the work, especially updates on project timing and budget. She and Kelsey Ann were spectacular when it came to picking materials, appliances and finishes, much of which was done via email and internet, as we could only spend limited time on the island. Heidi’s eye for design, knowledge of the budget, and understanding of my tastes and preferences ensured that decisions on choices and changes could be made confidently. As with any remodeling of an old home, there were more than a few unexpected surprises, resulting in potential upward impact on the original budget. Greg apprised us of these issues before proceeding, in terms of the cost impact, but more importantly, provided proposed mitigations and solutions, with acceptable and practical offsets from other parts of the project, so that we could stay close to the original budget. GNB were also very aware of financial initiatives and incentives form energy efficiency programmers, and ensured that plumbing, electrical, insulation, door and window choices optimized these incentives. The level of craftsmanship in our new home is a tribute not only to Greg, and his own very high professional standards, but to the teams and trades that he employs. The work ethic, and degree of professionalism exhibited at the worksite, by not only Greg, but all his sub trades, is reflected in the finished home. GNB were a delight to work with. There is not one thing in our ‘new’ home we would change. We have no hesitation in recommending GNB Inc to anyone who is thinking of remodeling or renovating. We are already planning some future work to recreational outbuildings, and will be ‘booking our slot’ with Greg and Heidi. Back in 2008, my wife Sheila and I started talking to Greg and Heidi about building us a very special home. This was something new for us, as we had never built before. These discussions with Greg, and Heidi, instilled a confidence that was so welcoming, and reassuring, and at the same time we felt that we were in good and honest hands. The build, from conception to the final home, could not have gone as smooth and relatively stress free as it did without the involvement of these two great people, as well as the quality trade’s crew that GNB employs. Quality is what it is all about and they settle for nothing less. We realized early on just how overwhelming a project like this could be. Heidi possesses an eye for interior and exterior design that is quite exceptional. Greg led us through the building process with more patience than I would have thought possible. His ability to design a building is akin to composing a picture. Our home was granted the gold level, built green designation, thanks to this very skilled and knowledgeable couple. GNB is an excellent company and one that Sheila and I would recommend to anyone wanting a top notch, quality built home. One thing I would like to note is that it will be three years in July since we moved into our home, and so far there have not been any problems or issues worthy of noting. GNB Builders built our beautiful home located in Ladysmith. From the planning the home, to interior finishing, to completion – both Greg and his partner Heidi kept in touch and were always available for discussion and brainstorming. We are happy to refer clients to them.